Eclipse fever is sweeping the United States. 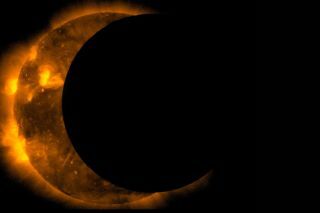 Millions of people are preparing to watch an epic solar eclipse that will be visible from coast to coast on August 21. But while the total solar eclipse is a natural phenomenon, occurring when the moon blots out the sun's disk as seen from Earth, a lab at Stanford is developing a system that would use orbiting spacecraft to produce artificial eclipses. The concept employs a device called a starshade to directly observe planets outside of our solar system. Extrasolar planets are extremely faint compared to their parent star, shining about 10 billion times fainter. To better see them, Simone D'Amico, director of Stanford's Space Rendezvous Laboratory, proposes a mini two-spacecraft system. The first — the starshade — would block out the light of the distant star, similarly to how the moon blocks out the light of our own sun. The second spacecraft would be a telescope that would work in the artificial shade and look for extrasolar planets. "With indirect measurements, you can detect objects near a star and figure out their orbit period and distance from the star," D'Amico, an assistant professor of aeronautics and astronautics at the university, said in a statement. "This is all important information, but with direct observation you could characterize the chemical composition of the planet and potentially observe signs of biological activity — life." Artist's concept of the mDOT system, which would test eclipsing technologies for looking at exoplanets. But D'Amico's system, which he is working on with Stanford physics professor and exoplanet scientist Bruce Macintosh, won't be big enough to look at Earth-sized planets that could host life. That sort of a mission would cost billions of dollars because the starshade would have to be huge (tens of meters in length) and deployed with spacecraft far away from each other in deep space, and a long distance from Earth's light interference. The goal instead is to launch a low-cost flight demonstration of the technology using miniature spacecraft to look at Jupiter-sized exoplanets. The lab's starshade has a diameter of only three meters (10 feet), fastened onto a microsatellite that weighs only about 220 pounds. It would work in tandem with a 10-centimeter (4-inch) telescope on a nanosatellite that weighs 22 pounds in high Earth orbit, separated by less than 620 miles. This mini system, called mDOT (miniaturized distributed occulter/telescope), could then provide a basis to apply the same concept on a larger scale in order to look closely at other Earth-like exoplanets. "So far, there has been no mission flown with the degree of sophistication that would be required for one of these exoplanet imaging observatories," Adam Koenig, a graduate student in the Space Rendezvous Laboratory, remarked in a statement. "When you're asking headquarters for a few billion dollars to do something like this, it would be ideal to be able to say that we've already flown all of this before. This one is just bigger." The tiny starshade will produce a tiny shadow, just tens of inches in diameter, so the telescope needs to precisely fly in the shadow, with an error of only 15 centimeters (six inches). The mission design only calls for this alignment to happen once every orbit, when the two spacecraft are furthest from Earth and moving the slowest in relation to each other. They will keep the eclipsing configuration for about an hour, then break up until the next orbit. This means that tens of hours of practice will likely be needed to ensure that the starshade works. It also means mDOT will have to fly autonomously, so that there are no communication delays from ground stations on Earth. If an eventual prototype is someday launched into space and succeeds, the number of distant exoplanet discoveries using direct observation seems sure to grow.